[/caption]You may have seen the new movie. You may have seen the Stallone movie. However, in the mainstream public consciousness, not much is known about the gritty law enforcer known as Judge Joseph Dredd. In commemoration of the new film, we’ll take a look at this classic British character. 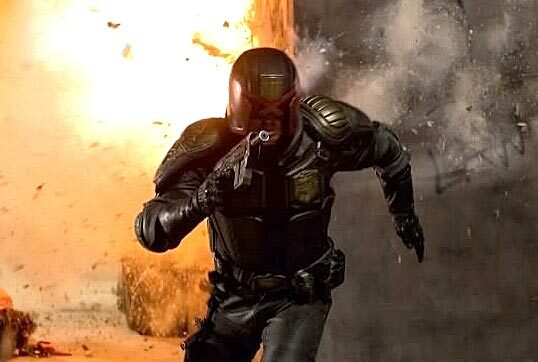 No that wasn’t a typo, despite the avenues in which we have been introduced to him, Dredd actually hails from across the pond as one of the flagship characters for the British comic magazine, “2000 A.D,” and debuted in the second issue in 1977. Here in the U.S., comic series are usually published in numerous single issues that compete for your hard-earned money. In other parts of the world, notably Europe and Japan, comics are usually serialized in larger anthology magazines that often carry translated versions of American comics alongside homegrown heroes. 2000 A.D. was created by IPC Magazines in 1977 to capitalize on the popularity of science fiction movies, with freelancers Pat Mills and John Wagner in charge of developing the format and the characters. The name was chosen for its futuristic sound and also for the fact that no one believed that the magazine would last until that year and beyond. The character of Dredd came about as a result of Mills’ experience working on the magazines Battle Picture Weekly and Action, most notably how readers responded to his anti-authoritarian attitudes. At the same time, Wagner had also written a story about a Dirty Harry-esque cop named One Eyed Jack for the comic anthology, Valiant, and saw a positive response to authority figures in the book. Wagner decided to take the character to the extreme, by creating an ultra-violent lawman patrolling a futuristic New York City with the power to arrest, sentence, and execute criminals. The name itself came from a horror strip that was developed for the magazine that following a “hanging judge” by the name of Judge Dread. The idea for the strip was ultimately scrapped, but the name was reworked and applied to the brutal law enforcer that would help kick off the magazine. The initial storyline for the character called for a setting in the not-too-distant future, but Ezquerra drew the visuals in a far more futuristic style than what was intended, prompting the writing team to set the story in a dystopian, post-apocalyptic future, with New York City turning into Mega-City One. There are many unique qualities to the “Judge Dredd” comics produced for 2000 A.D. The most notable is the fact that the character’s face is never revealed to the reader. In scenes where the character must remove his iconic helmet, his face always remains obscured. Another notable feature is how the events occur in real time. When a year has passed in the real world, then a year has passed in the world of the comic, with the characters aging accordingly. Over the course of the character’s 35-year run, he has since appeared in almost 1,800 single issues, in addition to 52 specials and 36 annuals. The character has also been featured in numerous crossovers with the “Alien” and “Batman” franchises. Despite the failure that was the 1995 film adaptation and subsequent DC comic series, the character has a loyal following. With complex themes and ever-changing world, the exploits of Judge Dredd enthrall readers to this day and will most likely continue to do so for years. Next Week: There will be no Weekly Reel next week as the school work has begun to pile up. I hope you will continue to support this publication.